Honor is like vitamin C—you know where it comes from (oranges) and what is produces (a stronger immune system), but you couldn’t say what it actually is (an ascorbic acid that forms collagen). 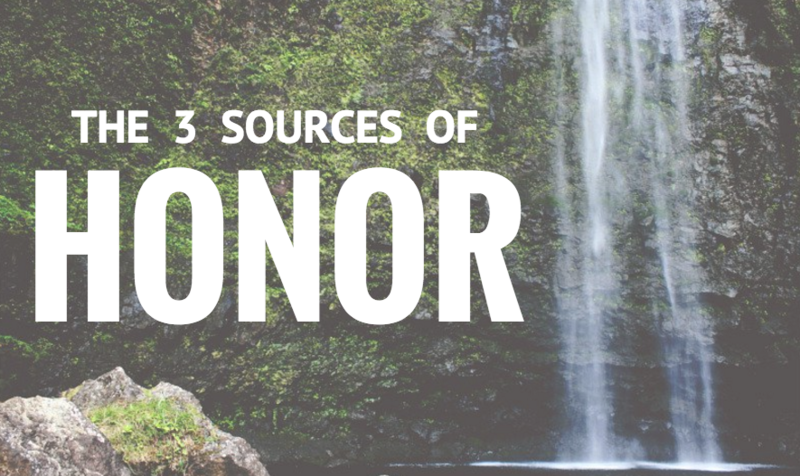 For this reason, one helpful way of describing honor is to explain its sources and consequences. The primary sources of honor are purity, faithfulness, and benefaction; the consequence of honor is group membership. The first source of honor is purity and cleanliness. This does not refer to physical hygiene, but to the cultural evaluation of peoples’ appropriateness and acceptability. Being morally clean means observing the right cultural boundaries. Purity is about the invisible social lines regarding what is acceptable at a certain time in a certain place (DeSilva, HPKP, 2000:243). Eating the right foods, keeping your shoes shiny and clean, separating from “outsiders,” and washing your hands in public are some examples of purity regulations. Personal cleanliness suggests personal value or honor. The shameful are polluted, defiled, and impure because of culturally inappropriate acts. Impure actions make a person “dirty”—which means they are a dangerous threat and should expect to be discarded from the group. Honor also comes from faithfulness and loyalty to the group. People in honor-shame cultures are members of a community that assumes mutual obligations and prescribed actions from each person. By observing the identity markers and traditions of the group, one maintains the implicit group covenant. Maintaining the covenant makes them valuable members who can be trusted to aid the group. Performing group expectations signifies loyalty and is rewarded with honor. You must go along to get along. People who are unfaithful to the group are shamed. Traitors get ostracized. Disloyalty cuts off access. Strength (not the mere possession of power, but the use of it for others) leads to honor. In the system of patronage, people with power and resources provide benevolence to poorer clients in exchange for honor. When honor is a prized commodity, there are cultural mechanisms for wealthy members to exchange power and wealth for honor. The weak and frail are considered liabilities to the group, and therefore are removed in shame. The diagram below visualizes the interrelationships of these dynamics. Purity, faithfulness, and benefaction are honorable qualities that cause group acceptance. On the flip side, defilement, disloyalty, and weakness are shameful qualities leading to group exclusion. This is the operating code of honor-shame cultures. 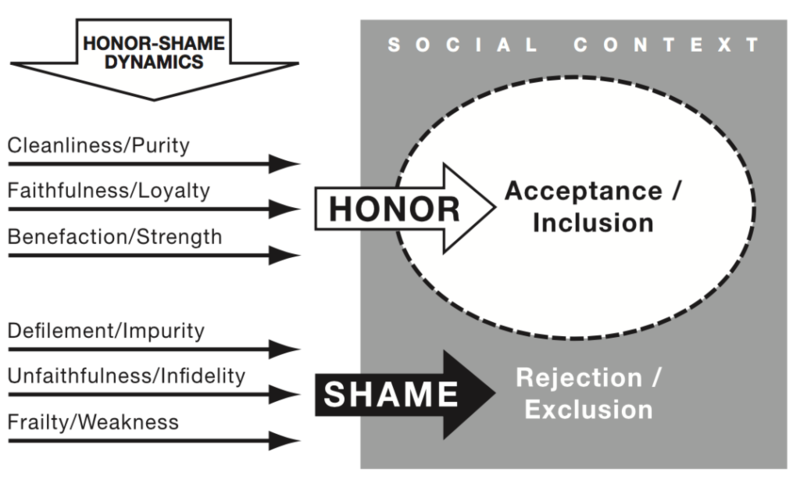 This framework integrates key cultural features (i.e., honor, purity, kinship, benefaction, community) into a unified socio-moral system and shows the linkage between each component. Can you think of a situation (from the Bible or your personal ministry) where this cultural code played out? Please share in the comment section below. This post is adapted from my Missiology article on Romans. The diagram is from Werner Mischke’s The Global Gospel (p. 167), used with permission. I am with you about the things that contribute to having honor. It’s a very good analysis of the ways people can gain (and lose) honor. However, I am a little curious as to why the consequences are divided neatly into two groups: the accepted and the rejected. In my experience, honor is much more of a gradient and less of a dichotomy. What I mean by this is that even within the “accepted” group there are members who are highly honored, and others who are just within the group parameters, accepted but just barely. And often the line between the two groups is blurry and not very clear. You are exactly correct; reality is more complex than diagrams. It’d probably be more accurate to present this concept with a gradient gray area (not solid line) between accepted and rejected. You are right in that even within an honor group, there are various positions of prominence and honor (see this post: http://honorshame.com/how-trump-thinks-like-jesus/ ). Thanks for clarifying this!